I'm once again slipping in a canonical entry because I love this Penguin paperback from 1987 with the great Jeremy Brett on the cover. Still my favorite Holmes, even in this age of Cumberbatch. With the faithful Watson at his side, the inimitable Sherlock Holmes faces some mind-boggling puzzles–and manages to come out on top every time! 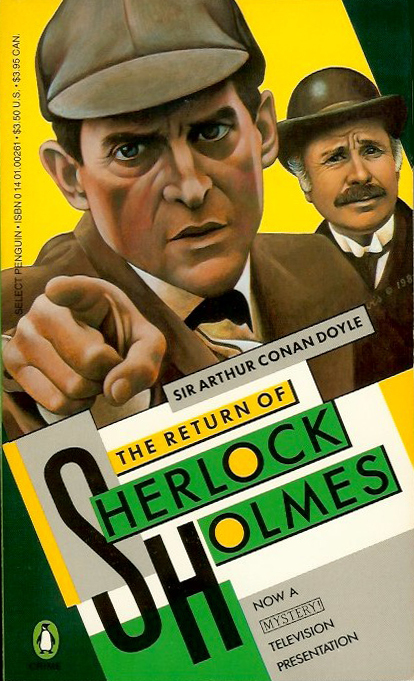 Holmes's clever investigations in "The Six Napoleons," "The Musgrave Ritual," "The Empty House," and the other intriguing cases replete with treachery, duplicity, and murderous evil display the unique powers of his eagle eye and brilliant brain. The Return of Sherlock Holmes is a dramatic series on Mystery!, a PBS television series presented by WGBH-TV, Boston, made possible by a grant from Mobil Corporation.